I've driven by this place multiple times next to Bass Pro Shop and finally talked myself into stopping today. I really wasn't expecting much. 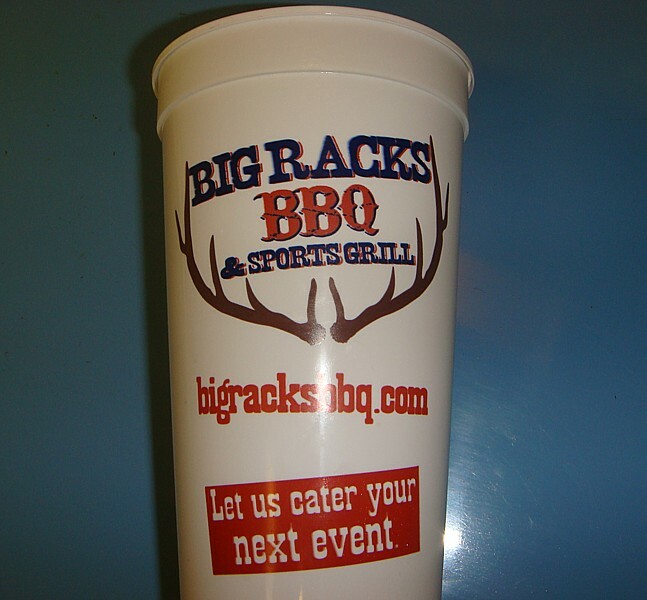 In the restaurant biz, this is in the "breastaurant" category, sort of like Hooters or Twin Peaks, only with BBQ. The inside was much as expected, lots of scantily clad ladies in a sports bar setting with flat screen TVs every two feet on walls covered with brick a brack kitsch. The surprise was the BBQ was pretty decent. I went for the Grand Slam 5 meat combo which came with brisket, sausage, pulled pork, turkey breast, and ribs. Of the meats, only the sausage was a disappointment. "Supermarket quality" says it all. The smoked turkey breast was thinly sliced, had very nice smoke flavor throughout, and perfect moistness. Some of the best smoked turkey I have had and almost on a par with my Mrs's smoked chicken. The brisket was equally nice, very tender and moist with nice smoke flavor and a hint of crunchy crust. The pulled pork had lots of smoky crunchy bits with a very sweet crust and was a tender chew. The ribs weren't as good as the rest of the meat but they were not terrible, either. These were "candy" ribs, with a sweet wet mop so thick they were almost gooey. I prefer to have a little more meat to taste in my ribs but these were overpowered by the heavy saucing. This partial rack was also a bit dry and overcooked, the rib tip was rock hard. However the inside was not too bad, meat pulled easily from the bone and it was not too chewy. I'd like to put it down to holding time til I get back to try them again. The sides were very un-inspiring and tasted like they'd come from a big tub. I had mashed potatoes and mac and cheese, for the record. The dinner also came with 2 dinner rolls and the little lady did a nice job of keeping my tea glass filled. For dessert, my server recommended the chocolate lava cake, which was some really rich hot dark chocolate cake surrounded with ice cream and whipped cream. Not too shabby. 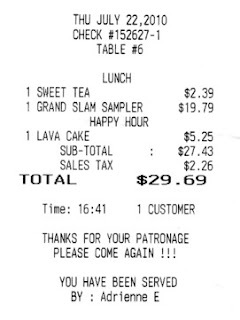 Apparently, happy hour is a good time to go because the Grand Slam is about $10 more at other times. Timing is everything. It is $19.79 during happy hour so I guess I did well to be there for the early bird special, being the old geezer I am. When I got there at 4 pm, the place was almost empty. It was bustling when I left a little before 5 pm. Unfortunately, being a BBQ opportunist, I didn't have my camera with me for plate pix this time. 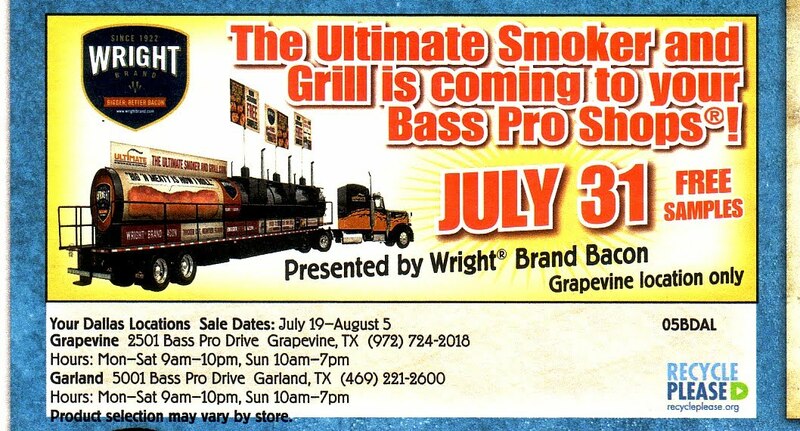 I suspect I'll need to go back to Bass Pro Shop someday soon and I'll make up for that. 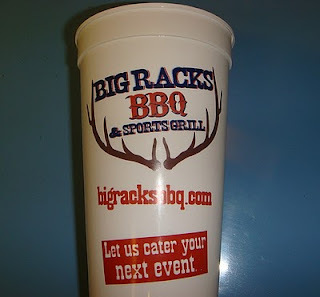 They have a website at: http://www.bigracksbbq.com/ but the only thing that seems to work is the front page. Coming soon to Grapevine, FREE BACON!